State capacity is a key determinant of development and growth (Besley and Persson 2009). Bureaucrats form an essential part of state capacity (Finan et al. 2015). They are responsible for raising taxes, providing public services, and implementing policies. How the personnel of the state perform is thus likely to have important implications for state effectiveness and economic performance (Evans and Rauch 2000). A longstanding challenge in governance is to ensure that bureaucrats are indeed serving the state, and do not abuse their public office for private gain. Throughout history there has been a shift from local rulers governing through kins, personal trustees, and court-servants to permanent professional civil services running nation states. A central objective of such bureaucracies was to devise systems and rules that reduced the patronage and corruption that had plagued earlier systems of government (Xu 2018). Bureaucrats, however, originate from particular localities which they will have a particular knowledge of and affinity with. One question that all centralised bureaucracies face therefore concerns whether bureaucrats should be allowed to serve in the areas they originate from. Allowing bureaucrats to work in their home areas is a double-edged sword. Sharing the same culture or speaking the same dialect might enable bureaucrats to communicate more effectively. Assigning bureaucrats to familiar environments may also allow the central government to tap into local information. Finally, bureaucrats may have greater intrinsic motivation to perform in areas they originate from. These very same features, however, can also hinder bureaucrat performance. Greater social proximity between bureaucrats and the localities they serve may increase collusion. Similarly, the greater informational advantage that home bureaucrats enjoy can also make it harder for the central government to monitor their actions. The same advantage could thus be exploited for private gain, or to put local interests above the national interest. Despite the policy importance, evidence on how social proximity affects bureaucrat performance remains relatively scant. This is the question we take up in this research by studying the elite civil service of India – the Indian Administrative Service (IAS) – often also called the ‘steel frame of India’. The IAS is particularly important as the close to 4,000 centrally recruited officers from this service effectively run India, heading up all government departments at both the central and state levels. Understanding how the manner in which they are allocated across the country – specifically whether or not officers are able to serve in their home state – affects performance, could help improve state-level policies and country-wide patterns of growth and development (Asher and Novosad 2015, Bertrand et al. 2018). To look at this issue we collaborated with the IAS training academy – the Lal Bahadur Shastri National Academy Administration (LBSNAA) – to combine administrative records with survey data on the subjective performance of IAS officers across the major states of India. These survey-based measures, in which we elicit the perceived effectiveness, probity, ability to withstand illegitimate political pressure, pro-poor orientation, and overall performance, allow us to overcome a key challenge in the study of senior civil servants – namely, the measurement of their performance. In order to estimate the effect of home state allocations, we leverage detailed institutional knowledge of the home state assignment rule to isolate a ‘chance variation’ that predicts whether an officer is allocated to his home state (Xu et al. 2018). 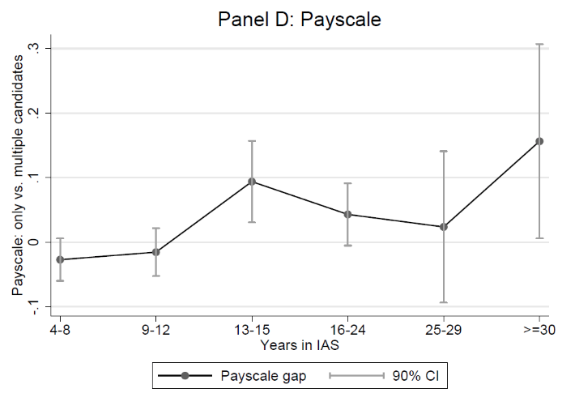 Specifically, we exploit the fact that the number of IAS entrants who compete over a fixed number of the coveted slots earmarked for home service varies over time – the more IAS officers from the same state that enter in a given year, the lower the chance of any given officer receiving a home allocation. How many officers from the same state enter in a given year fluctuates wildly over the years, however, as it depends on who makes the cut in the competitive entry exams. This effectively provides a lottery for home state assignments that enables us to study the performance difference among a set of officers that are comparable, but differ in whether they were assigned to their home state or not. Our main finding is that officers allocated to their home state perform worse than comparable officers who are allocated to non-home states. On average looking across the entire nation, we find that officers allocated to their home states are deemed to be more corrupt and less able to withstand illegitimate political pressure. The extent to which home allocations worsen performance, however, varies substantially across states. Home-state officers perform worse in states that score higher on corruption as measured by the Transparency International score. Consistent with this subjective evidence we find that, in the more corrupt Indian states, home-allocated officers are more likely to be suspended primarily due to having court cases pending against them. To study how the performance difference unfolds over time, we show that the negative performance gap between home- and non-home state IAS officers is particularly pronounced in the later career stages. These are career stages where, we argue, there is more room for patronage and capture of the bureaucracy by the local political elite. Interestingly, it is exactly in those career stages where home officers perform worse in which we observe their greater promotion prospects (Figure 1). 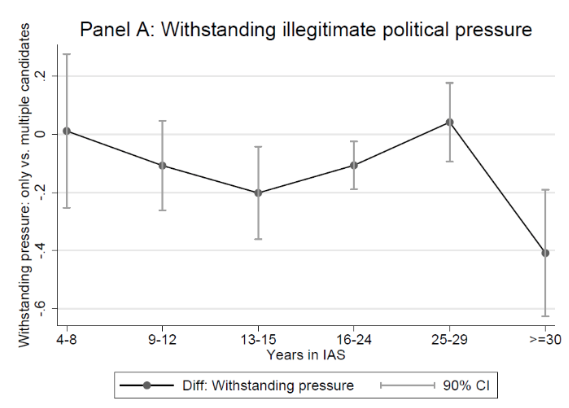 We provide corroborating evidence that home officers, especially more senior ones, are more susceptible to capture by the political elite by investigating differential patterns of political interference in the careers of IAS officers based on their proximity to chief ministers, the political heads of Indian states. 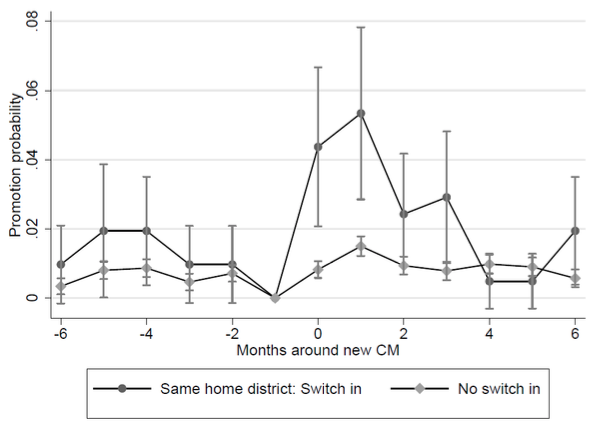 When moving to a high-frequency event study, we find that senior home officers are on average reshuffled more frequently, and more likely to be promoted in the immediate months following the appointment of a new chief minister. Furthermore, this surge in transfers and promotions is magnified for those home officers who originate from the same home district in the state as the incoming chief minister (Figure 2). The combined results are consistent with social proximity adversely impacting bureaucrat performance through political favouritism. These findings thus resonate well with the historical literature which highlights the tension between the need for local knowledge and the challenge of capture and clientelism in settings ranging from the administration of Empire to the allocation of modern-day civil servants and ambassadors. Perhaps more importantly, the results also have important implications for a whole host of less-developed countries that are in the process of building state capacity (Besley and Persson 2009). In these contexts, assigning officers back to environments which they are most socially proximate with may actually limit their ability to effectively serve the nation. This is an interesting result, as we know that such home avoidance rules run counter to the preferences of the officers themselves. While related research has suggested that rewarding performance with individually preferred postings may be an effective incentive mechanism (Khan et al. 2018), our results suggest that a policymaker may nonetheless seek to deliberately mismatch subordinates’ preferences and location assignments if their private gains are misaligned with public gains – in this case, due to greater likelihood of local capture. Asher, S and P Novosad (2017), “Politics and local economic growth: Evidence from India”, American Economic Journal: Applied Economics, 9: 229-273. Bertrand, M, R Burgess, A Chawla and G Xu (2018), “The glittering prizes: Career incentives and bureaucrat performance”, mimeo. Besley, T and T Persson (2009), “The origins of state capacity: Property rights, taxation and politics”, American Economic Review, 99(4): 1218-44. Finan, F, B Olken and R Pande (2015), “The personnel economics of the state”, NBER. Working Paper No. 21825. Iyer, L and A Mani (2012), “Travelling agents: Political change and bureaucratic turnover in India”, Review of Economics and Statistics, 94: 723-739. Rauch, J and P Evans (2000), “Bureaucratic structure and bureaucratic performance in less developed countries”, Journal of Public Economics, 75(1): 49-71. Xu, G (2018), “The costs of patronage: Evidence from the British Empire”, American Economic Review 108 (11): 3170-98. Xu, G, M Bertrand, R Burgess (2018), “Social proximity and bureaucratic performance: Evidence from India ”, NBER Working Paper No. 25389.